Unbolt tie rod and break apart (I tapped on side of socket then pounded on bolt with castle nut flushed but you can use a pickle fork). Take care not to rip boot. Drop the control arm and pull out. Passenger side control arm removed. 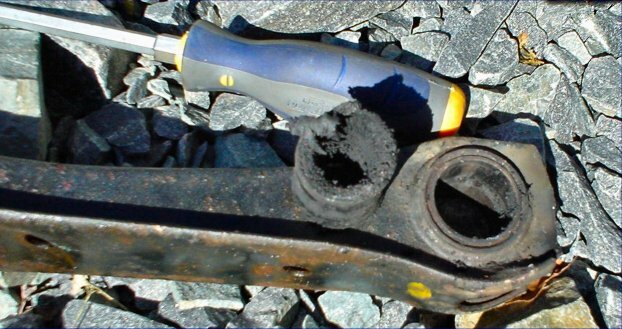 Note the longer bushing is on the backside of car. 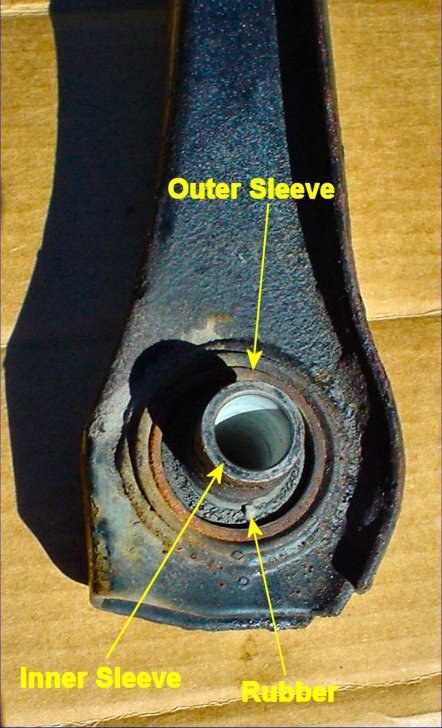 The old rubber bushing is sandwiched between two sleeves (inner and outer). 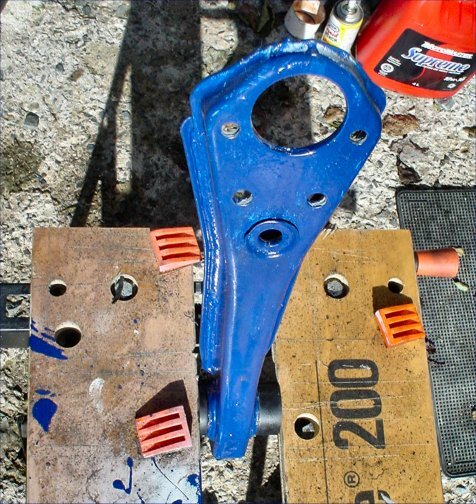 Both are not needed when installing new Energy Suspension bushings. The inner sleeve must be pressed or cut out to ensure correct fit of the new bushing. 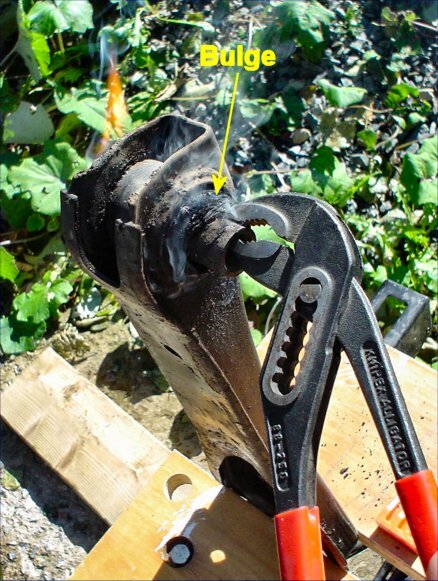 To remove the inner sleeve, heat the assembly (both ends of bushing and center) with a propane torch. 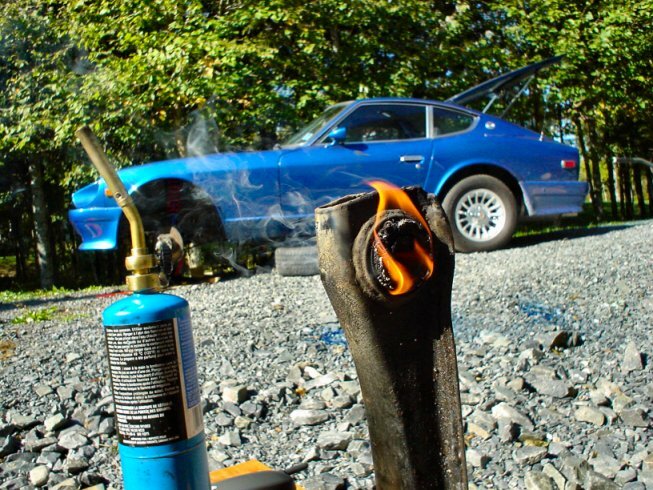 Don't worry if the rubber catches fire. Just watch out for hot dripping rubber! When the rubber bulges out of both ends, it has detached from the sleeves and can be worked. Pull the inner sleeve out using pliers. 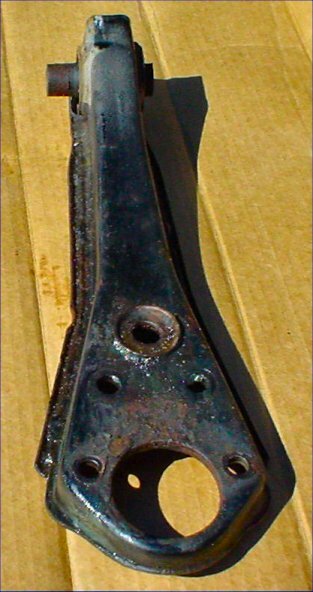 Slide a large flat screw driver blade down between the outer sleeve and rubber bushing. Pry the rubber away from the wall. 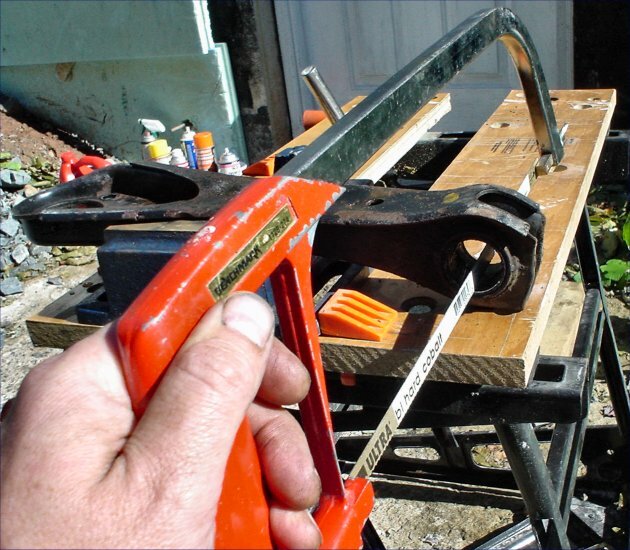 Pry out the rubber or pull it out with pliers. The outer bushing can now be pressed or cut out. Since I don't have a press, I cut. Hire a magician to poke a hack saw through the bushing hole as shown. Cut using long, level strokes. 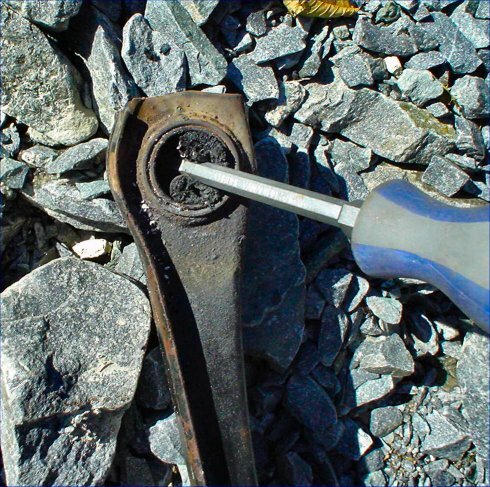 Check often to ensure even depth across the bushing. 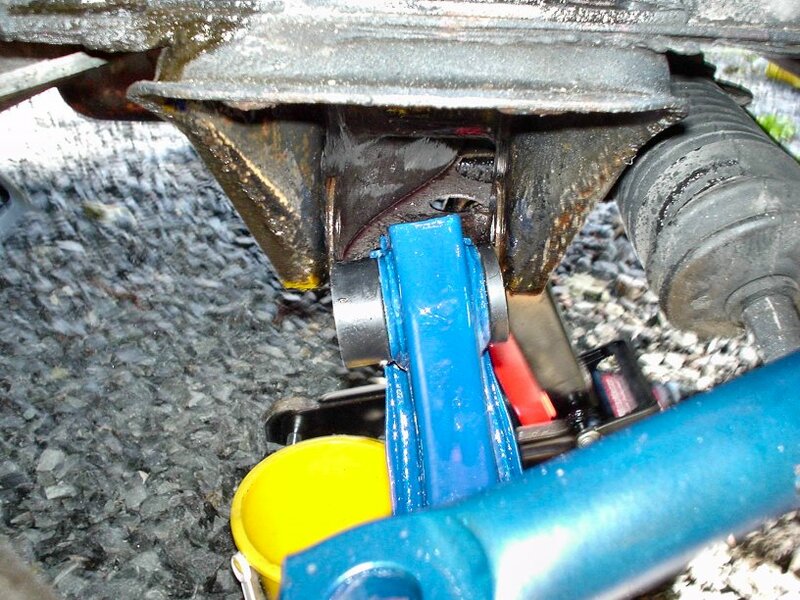 note: 240/260Z from zcar.com recommends Scott Bruning's (previous owner of Ztherapy) suggestion of cutting towards the outer end of control arm. Stop cutting when you break through. It is not obvious so you have to monitor it as you cut. 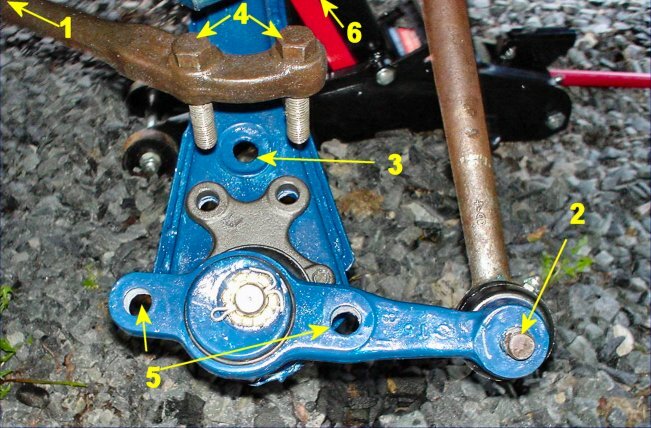 Since the outer sleeve is seized to the control arm, you must pry it loose before pressing out. 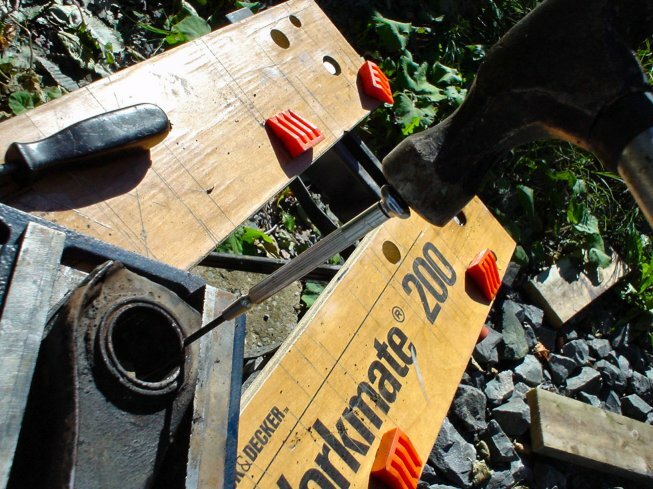 Use a disposable awl or small flat head screw driver. (Heat may also work). Tap the screw driver between the outer sleeve and control arm working from the cut. 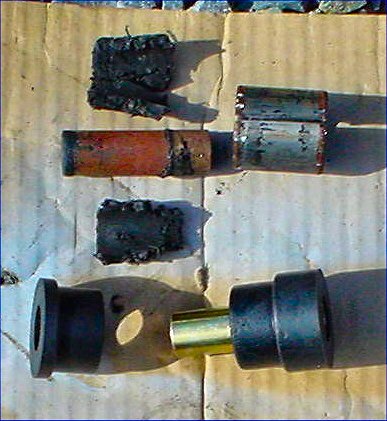 Do both sides of the bushing. 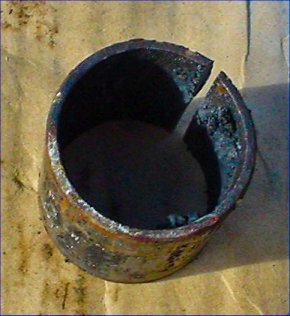 Using an anti seize solution helps. Once the outer sleeve is partially separated, you can start tapping it out. My hammer was a similar diameter so I could "persuade" it out. 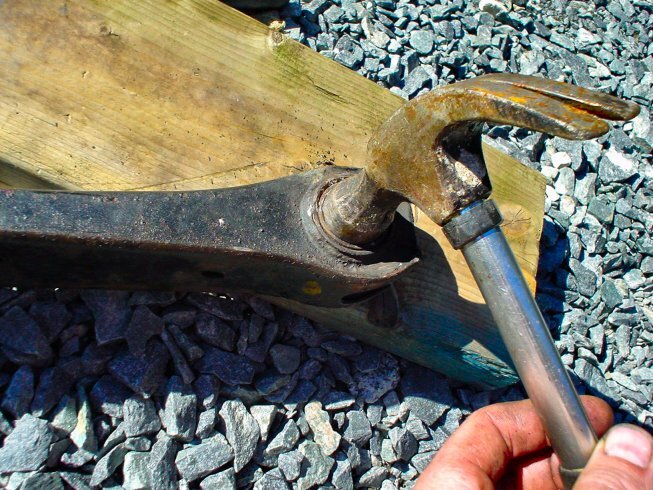 When the sleeve is too deep for the hammer, it can be worked out with a "disposable" screw driver. 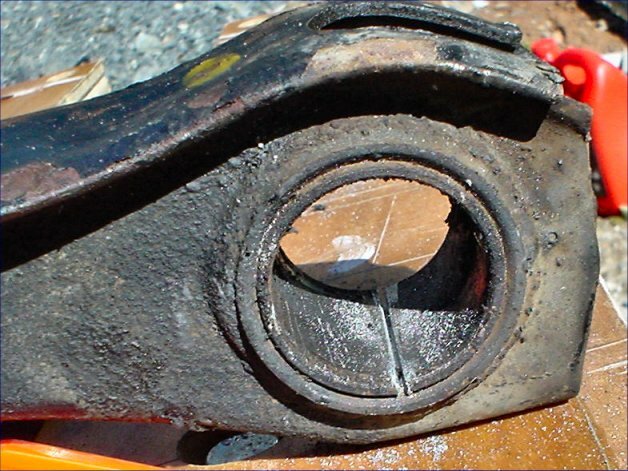 Note that bigger bushing is on the rear side. Also note that the new Energy Suspension bushings do not use the outer sleeve. 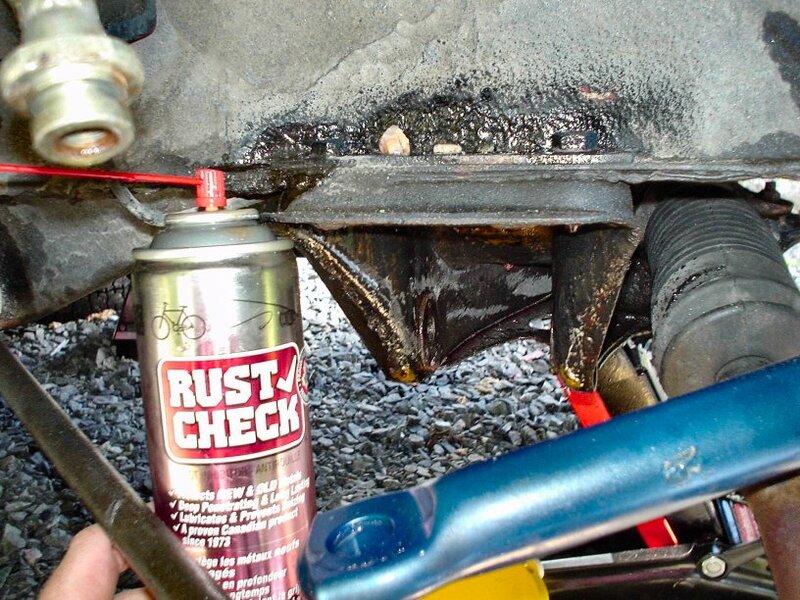 Sandblast or wire brush the surface rust from the control arm and coat with a rust neutralizer (phosphoric acid). 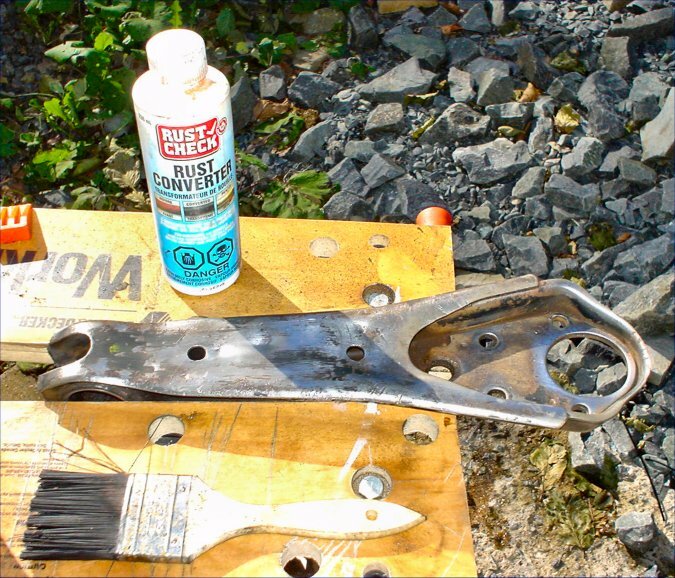 When cured, wipe off gunk and paint with anti-rust primer then finish with anti-rust paint. Grease and insert bushings then grease and insert the inner sleeve. 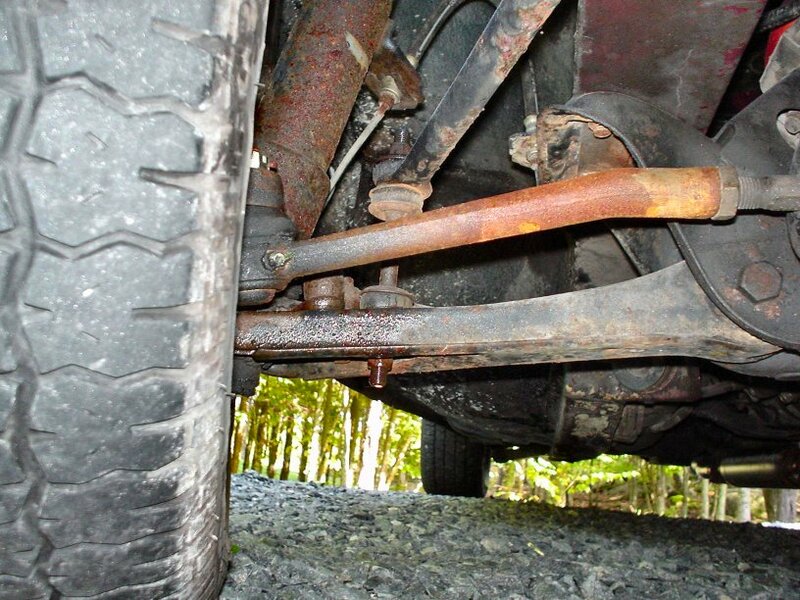 note: this is the driver side control arm with bigger bushing facing back of car. 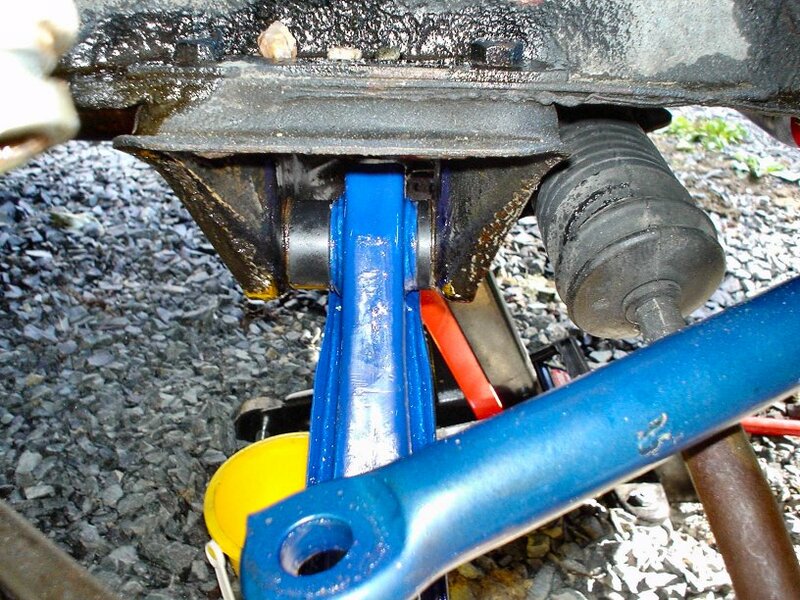 Coating the area with a lubricant will also assist in fitting the control arm. 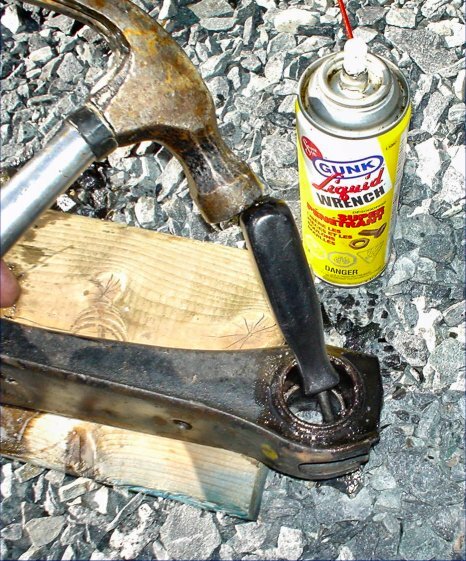 In this case I used a preventative rust treatment and killed two birds with one stone. Now the last trick: fit the front side in first then work the back in. Wiggle front to back while working the sleeve into place.